Elm Shakespeare Company returns to New Haven’s Edgerton Park this summer with one of the Bard’s less performed plays, Love’s Labour’s Lost. Celebrating its 23rd season, Elm Shakespeare is Southern’s theater company in residence and provides world-class theater, free of charge, to audiences of approximately 30,000 people from throughout greater New Haven and statewide. This year will mark the company directorial debut of Producing Artistic Director Rebecca Goodheart and will also feature the return of Elm Shakespeare Company Founding Artistic Director James Andreassi in the role of Don Armado. This year’s production will also feature acclaimed professional actors and theater professionals with ties to Southern, including SCSU faculty and sound designer Mike Skinner, Theatre Department Chair Kaia Monroe-Rarick, and lecturer Benjamin Curns. The company also employs a number of current and former Southern students as actors and production staff for the summer, including senior Matt Iannantuoni as company manager and recent graduates Kevin Redline as wardrobe supervisor, Ashley Sweet as second assistant stage manager, and Cailey Harwood Smith as property master. The Love’s Labour’s Lost cast also features several SCSU alumni, including Betzabeth Castro as Katherine (pictured above), Brianna Bauch as Moth, and Gracy Brown as Boyet, as well as senior Sasha Mahmoud as Maria. The powerful longstanding partnership between Elm Shakespeare and Southern, begun in 1997, became official in 2016 with the signing of an official Memo of Understanding designating Elm Shakespeare as the Theater-in-Residence at Southern. Elm Shakespeare now has offices on campus, offers a variety of its educational programs to youth ages 7-18 at Southern, and is fully integrated into the SCSU Theatre Department activities and facilities. The 2018 production of Love’s Labour’s Lost is a whimsical jazz-age tale chock full of witty wordplay, music, dance, and riotous mishaps. Love’s Labour’s Lost marks the start of Shakespeare’s most lyrical comedies. With live music before and throughout the performance, Elm’s production promises to be as luscious in language and look as Edgerton Park itself, while posing questions about consent, class, and a woman’s role in the political arena. Love’s Labour’s Lost is a tale of love — for big ideas, for delicious words, and for that special someone. The King of Navarre has sworn to give up the pleasures of the world for serious study and contemplation. But when the Princess of France arrives, exuberant frivolity triumphs over studious drudgery, and the whole town erupts in pursuit of what (and who) they love! 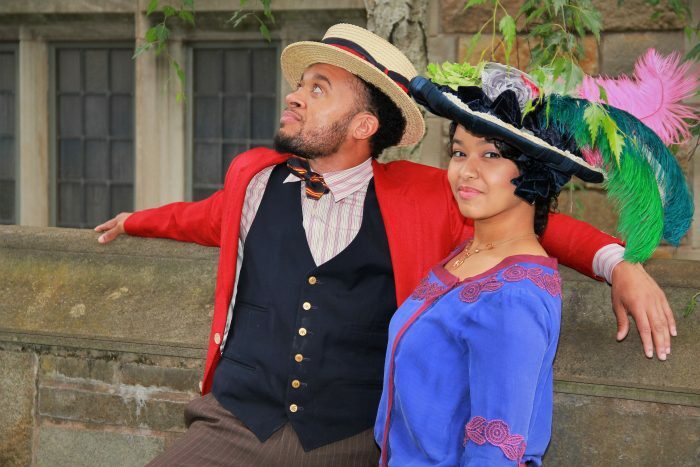 Summer performances will run Thursday, August 16 through Sunday, September 2, Tuesday-Sunday at 8 p.m. (with live music beginning at 7:30 p.m.) in Edgerton Park in New Haven, located at 75 Cliff Street. The performances will be free to the public with a suggested donation of $20, $10 for students and $5 for children 12 and under. Picnicking prior to the performance is encouraged. Visit the Elm Shakespeare website for more information on cast and production staff bios, play synopsis, directions, news on New Haven food vendors in the park, Tree Talks, and protocol for cancellations due to inclement weather.